The sun’ll come out…. tomorrow? ….From the looks of it, no. But here’s for hoping! The 2011 Solar Decathlon officially started on 9/22 with public tours beginning today, 9/23 at 10 am. There are 15 members of the Missouri S&T Solar House Team here in Washington, D.C. to check it out. We have 7 alumni members from the 2005, 2007, and 2009 teams, 3 current team members who were also part the 2009 team, and 4 decathlon virgins (including our main advisor). The three undergraduate decathlon newbies (Aaron Enz, Emily Vandivert, and Charles Wright- pictured right to left- who are current team leads and future officers….right? wink, wink) were sponsored by the team to come check out the 2011 competition. Right now the team is working on proposals for the 2013 Solar Decathlons in China and the US. If we get in, it will be the first time that there is 100% turnover from competition to competition within the team. This means it’s important for newer members to understand how the contests work, and what they are up against. Aaron, Emily, and Charles may have gotten 2 days off of school- but not without some homework. They have to score the teams and predict the final rankings of the competition. Also, when we get back to Rolla, they must give a presentation to the team at a general meeting about what they saw and learned. Check back tomorrow for more about the houses we saw and which were our favorites and why! So what’s it like to live in a Solar Village? I for one am having a fantastic experience. My name is Anna Osborne and I’m the Director of Public Relations for the Missouri S&T Solar House Team. Thanks to the Office of Sustainable Energy & Environmental Engagement (OSE3) I get to live in the 2005 solar house this semester. The other two houses are occupied by David George (Project Manager for the Solar House Team) and the Oerther family (Dr. Oerther- professor of Environmental Engineering at S&T). This summer I worked as a research intern at Purdue University in Indiana. So when my lease started my parents moved my stuff in for me (so nice of them, right?) and took the opportunity to use my house as a little vacation get away from St. Louis. As soon as I moved in, I took the opportunity to learn more about how the house works passively. You know what? It was designed very well! The size and shape allows it to be easily cooled by cross ventilation- especially at night when the temperature drops. I can cool the house down, then close the windows and blinds during the day and it keeps its temperature pretty well below 84 degrees. Some days it gets too hot and I had to turn on the AC to keep things comfortable, but overall- I’ve only had it on for a handful of days over the past 4 weeks. What else do you do in a Solar Village? Well, make homemade hand-churned ice cream! I got a churn for my birthday and tested it out on some experimental vegan ice cream. It was so so, definitely different from normal ice cream. 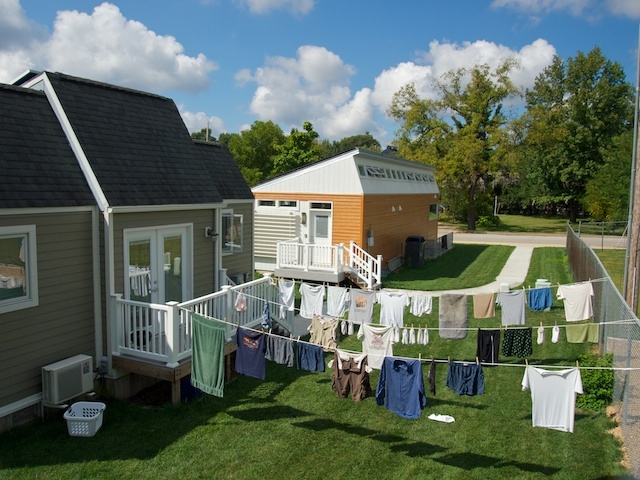 Weather permitting, I also dry my clothes on the clothes lines David put up in the back of the 2002 house. Overall, I am really enjoying my time here at the Village. On a side note, since I graduate this December, OSE3 is looking for a tenant to take over my lease beginning in January 2012. If you are interested, or want to learn more, e-mail Julie Wilson (wilsonjulie@mst.edu).